As an attorney, Robert Coates’ practice spanned from criminal up to and including murder, civil cases involving both State and Federal Courts, and environmental and mining, injury and mental health law. His present firm feaures lawyers, civil litigators, and out-of-court transactional attorneys: an experienced and knowledgeable team. Judge Robert C. Coates knows his way around the legal world; around the worlds of community and public life; around the worlds of service. 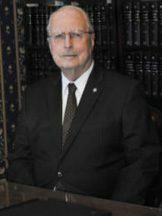 He has served as a Rotary Club President, and as Politics President or chair of a dozen legal and community organizations including the County Public Law Library. He currently chairs the Homeless Women Task Force and Rotary’s Project, Understanding Climate Change.